Sometimes wildlife is hard to spot, especially if it's nocturnal. But the signs that animals frequent an area can be a good start to discovering all kinds of species, from rare otters to common rabbits. If you encounter animal poo, take a note of the size, shape and colour, and break it apart with a stick to see what’s inside. But never touch it – it can contain harmful bacteria! Whose poo have I found? Foxes produce dog-like droppings that are usually pointy and twisted at one end and full of fur, feathers, tiny bones, seeds and berries. 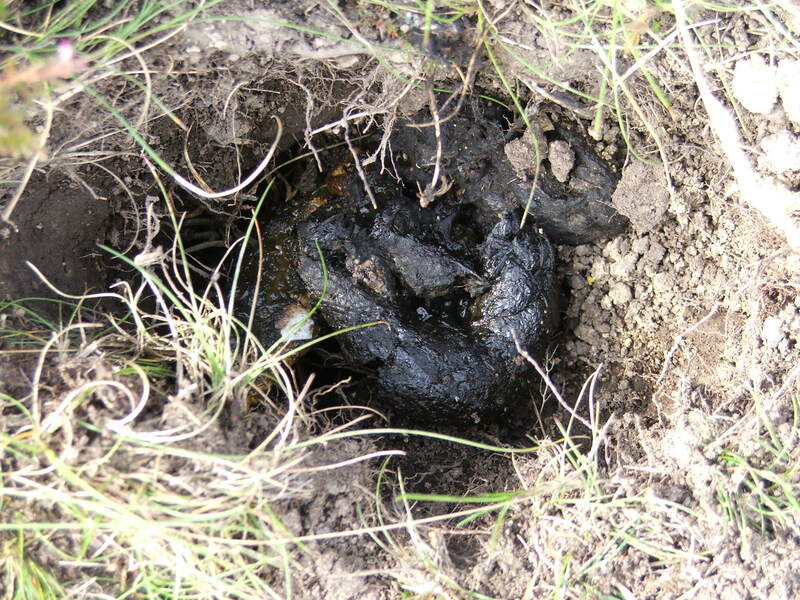 In rural areas, fox poo is quite dark, but in urban areas, where foxes eat human food waste, it can be lighter. Fresh droppings have a distinctively musky or ‘foxy’ smell. 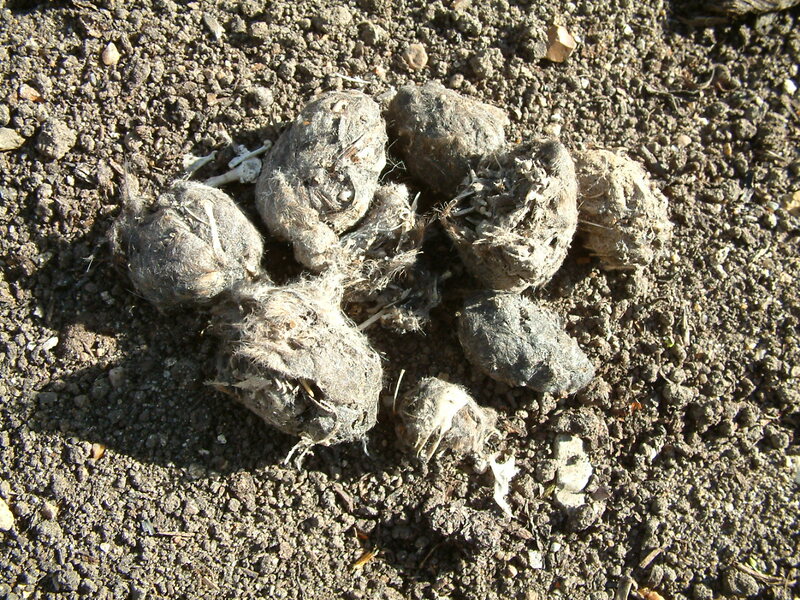 Hedgehog droppings are about 5cm long, cylindrical, usually tapered at one end and generally quite dark. They might be filled with bits of insects and worms. They can also appear slimy if they've been eating slugs and snails. 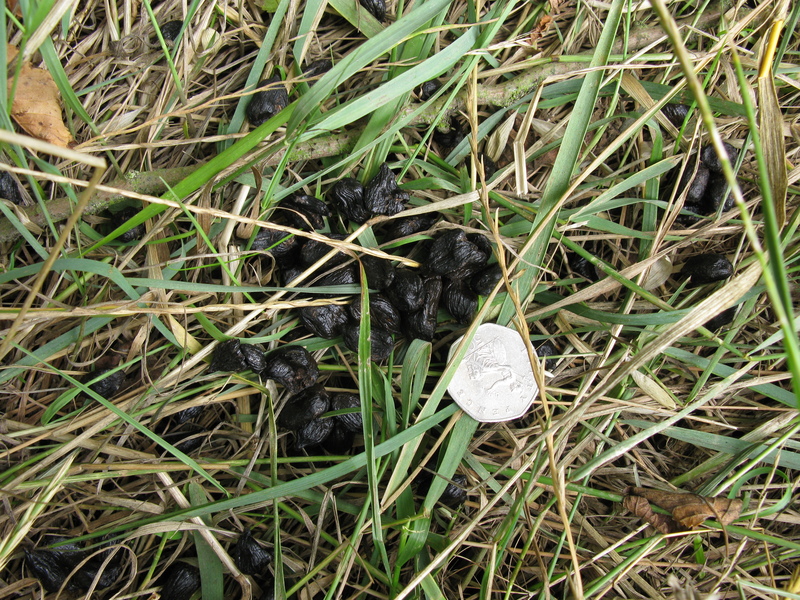 Because deer ruminate (regurgitate and chew their food twice before digesting it), there are no obvious contents in their droppings. They produce smooth, shiny, dark pellets that are pointy at one end and often stuck together in clusters. Similar in size and appearance to large raisins. Both are found in similar wetland habitats. Otters produce droppings known as ‘spraints’ which are left in prominent places along riverbanks, on rocks or under bridges to mark their territories. 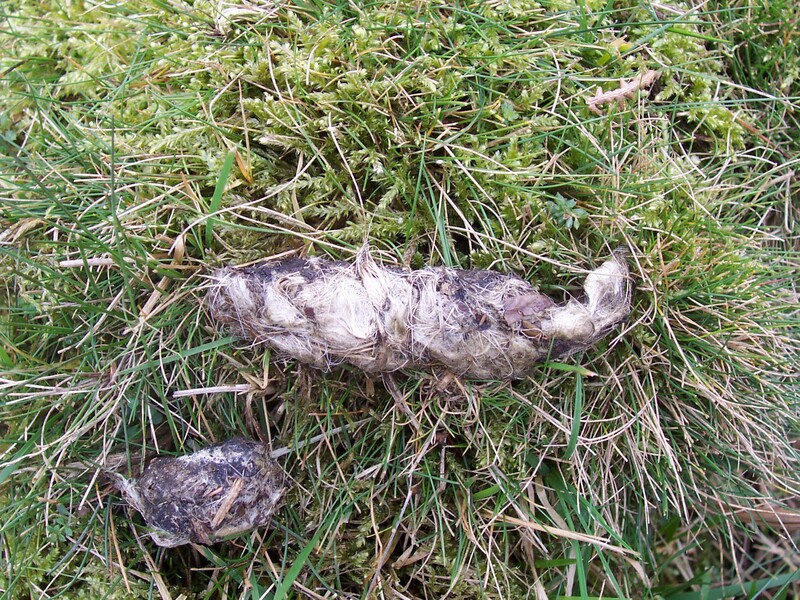 Otter spraints are usually dark green, slimy and full of fish bones, scales and crayfish parts. The ‘scats’ of American mink are smaller, black and contain fur, feathers and bones. Fresh otter poo smells like jasmine tea, while mink poo has a much less pleasant odour. 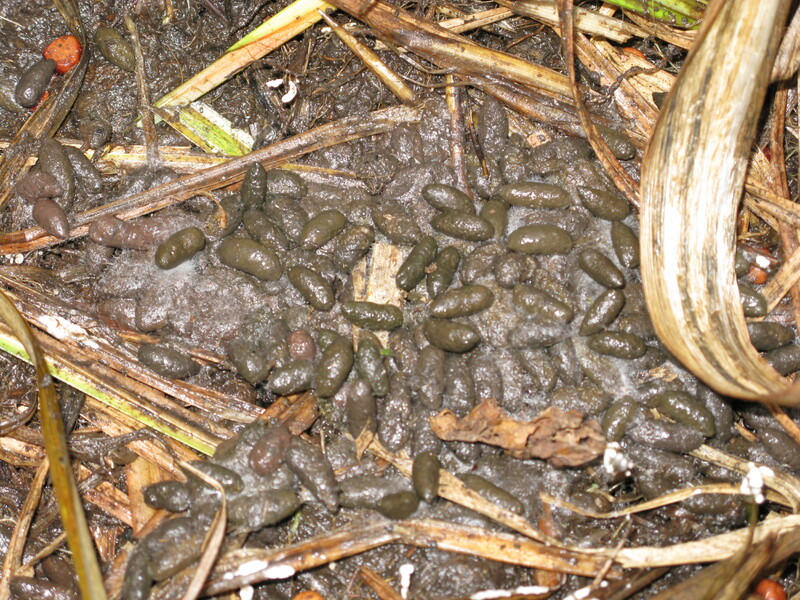 Water voles leave their droppings in large ‘latrines’ (piles), close to the water. The droppings are small and rounded at both ends. They can appear green, brown or purple, have a putty-like texture and no strong smell. 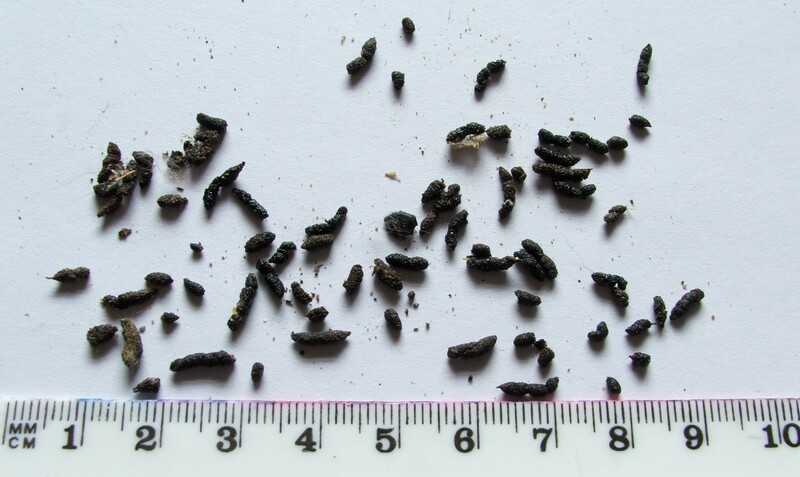 Water vole latrines could be confused for rat droppings, but the noticeable differences are rat droppings are flattened one end and pointy the other, are a darker brown or black colour and have an unpleasant wee-like smell. It looks like poo but could it be something else?